Sanford 27055 Prismacolor Premier NuPastel Firm Color Sticks 96 set Assorted. Perfect for delicate shades and subtle blends, assure uniform coverage and balanced composition in your artwork. Rich, creamy textures for easy blending and shading in 96 assorted colors. Each stick measures 3 5/8" long and 1/4" square (92mm x 6mm). Sticks can be sharpened for precise line work ideally suited for illustrations. Stronger for less breakage and dust, easier clean-up. Use NuPastels when laying in darks in a pastel painting or NuPastels wet with a brush using water for a cake watercolor or crushed NuPastels mixed in a gloss/matte medium to add to acrylic paintings to create textures on your canvas. 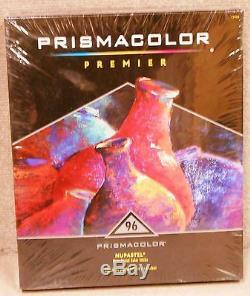 The item "Prismacolor Premier NuPastel Color Sticks 96 Set" is in sale since Tuesday, December 10, 2013. This item is in the category "Crafts\Art Supplies\Drawing\Pastels". The seller is "rosjeff" and is located in US. This item can be shipped to United States.